Postcards from Manila: #7 Forest or Trees? Do you see the forest or the trees? That's a big question commonly used to discern one's perspective in life, but luckily we outdoor photographers have simpler things in mind today. We were in the town of Kiangan, the Philippine's oldest rice terraces town and one of five World Heritage sites in the province of Ifugao. We were on our way to visit an upland lake when we chanced upon this roadside scene. 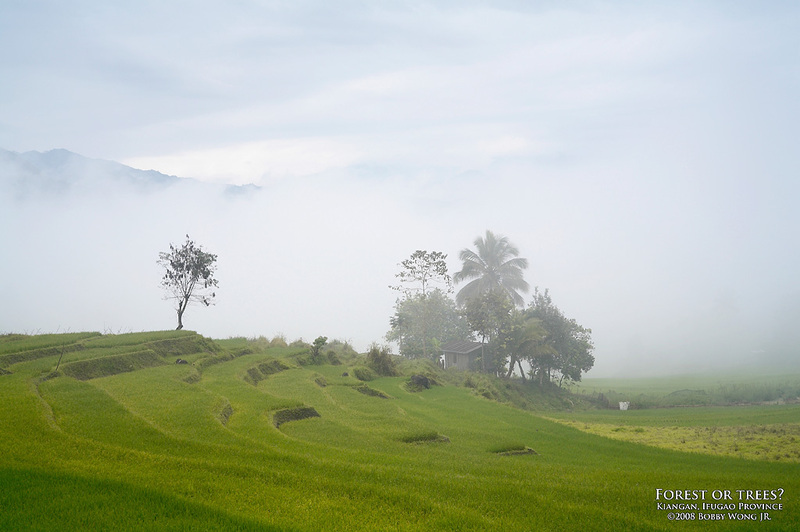 Thick morning fog had descended on rice paddies in front of a wooded field. A single tree can go unnoticed in a forest, until a curtain of fog obscures the rest. Quickly, we shuffled out of our jeep and selected our compositions to best convey what the moment presented. The simple answer to the big question: it depends on the moment. Enjoy. If I am right, this pic was taken on the way to Ambuaya lake and the location where you took the pic looks like you were pretty close to where my grandparents are resting in peace. Very nice pics Bobby. Makes me want to visit the different places you have been to and hopefully sometime in the near future. You got mad skills, Keep up the good work!! Wow! This is splendid, indeed! It's just amazing how i am looking at this from afar and how it brings back sweet memories from yesteryears when we used to pass and frolic along the narrow pathway in this very ricefield while on our way to ambuaya lake. like they say one gets to enjoy the beauty of the forest from a distance. Thanks a lot sir bobby. It makes me wanna scram out of the city and head for home..
not forest, not tree, simply beauty is all over this photo. great shot. what a magnificent shot,very peaceful,you have such a talent,you moved me,all the pics you took have their own beauty,breathtaking,thank you for sharing these masterpieces.pls. make a book for these masterpieces.keep up the good work.